I am heading back home after a simply amazing field trip to the Yukon Territory. 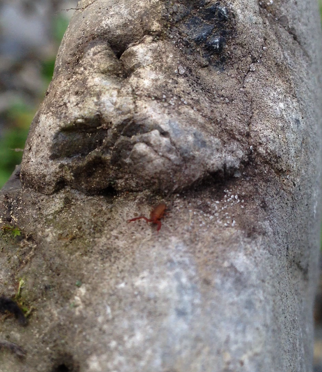 As mentioned in a previous post, one of the goals of the trip was to collect more specimens of an Arctic pseudoscorpion Wyochernes asiaticus (Family Chernetidae) – a Beringian species known from Siberia, Tibet, and the Yukon. This species survived the last great glaciation event in North America by living in unglaciated regions of the northwest, including parts of the Yukon. In 2008 I had collected this species under rocks beside high elevation and high latitude creeks and rivers in a few locations in the Yukon. On this trip, my goal was to collect more specimens to further assess the distribution of this Beringian species, and to gather more life-history information including estimates of size and fecundity. Because of the relative rarity of pseudoscorpions, few data exist that describe life-history parameters of these arachnids. 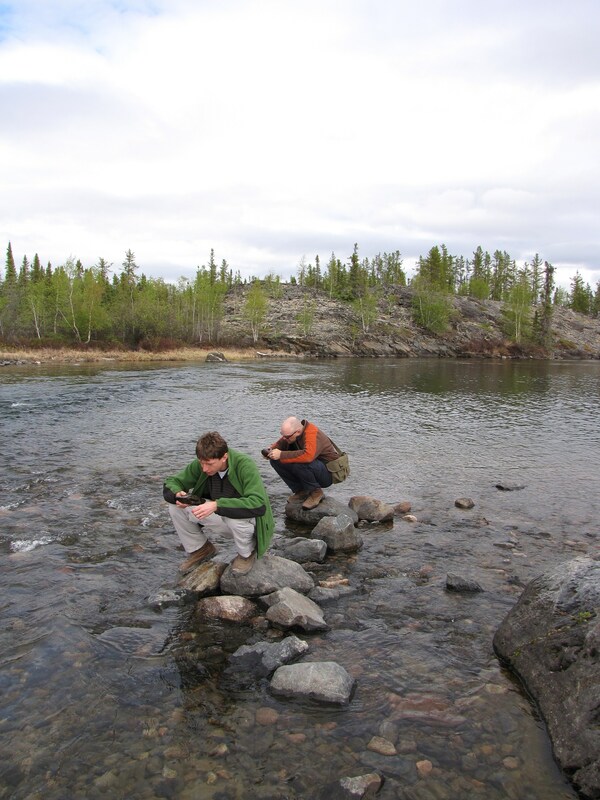 An Arctic, high-elevation stream in the Northwest Territories: pseudoscorprion country! I was also able to capture some video of these pseudoscorpions – as far as I am aware, Wyochernes has never before been videotaped, so this is the FIRST EVER movie of this species! 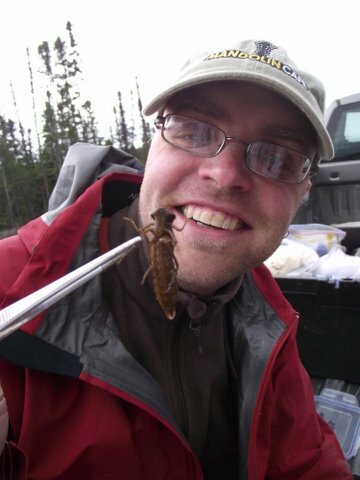 Our larger research goals included more than pseudoscorpion colleting, and I was in the Yukon with a wonderful team of scientists, including my graduate students Crystal Ernst, Katie Sim, a post-doctoral researcher Dr. Laura Timms, and an entomology professor from the University of Manitoba, Dr. Barb Sharanowski. We all had different objectives and goals for the Yukon trip, and over the next couple of weeks. I will post some more research stories from this field-work to give a sense of the scope of our research efforts in the Yukon. A couple of weeks ago I was fortunate to be able to attend a workshop about monitoring terrestrial arthropod biodiversity in the Arctic. In advance of that workshop, I offered to prepare a draft of a food-web that was ‘Arthropod-centric’. 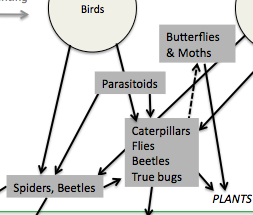 There are many ways to build a food-web, and my first draft was focused on who eats whom. In other words, an arrow depicting interactions would indicate predation (loosely defined). An alternative would be to focus on energy moving through the system (i.e., the arrow would move ‘up’ from trophic level to trophic level, to indicate a transfer of energy). When working on this food web, some interesting generalities are emerging: First, the overall dominance of Diptera (flies). This is certainly because they do everything (e.g., decomposers, pollinators, blood-feeders) and they are very diverse. Second, arthropods are integrators – meaning they connect different processes, and they bridge different systems (aquatic/terrestrial). Third, highly valued vertebrates (and humans!) depend on arthropods (and/or are affected by them). 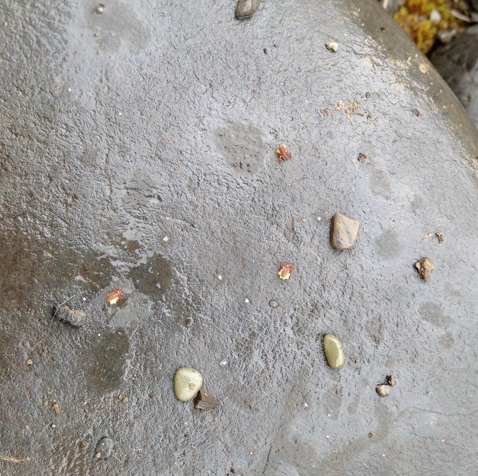 ….what interactions do you think are important in the Arctic, from an arthropod perspective? ….how can the interactions between vertebrates and invertebrates best be depicted? ….what ecological processes should be included in an Arctic food-web? There are other Arctic food-webs out there. The Bear Island food-web is probably the best one that focuses on Arctic arthropods. If you’ve not seen it, the paper by Ian Hodkinson and Stephen Coulson (2004) is worth a look. That food-web is more specific than the one I am working on (it should be since it’s focused on a specific location and it can be because a lot of research has occurred there!). I really like one of the last sentences in their paper: ...the Svalbard high Arctic terrestrial food web is far more complex than has previously been appreciated but further sections remain to be resolved. Indeed! I would argue that we need to develop these kind of specific food-webs from other locations in the Arctic, but to get there, we also need a general, broad overview that encapsulates the overall role and importance of Arthropods to the Arctic. Hence the development of a general food web. Social media can be used effectively as a platform for soliciting feedback and generating ideas about science, including specific projects such as building a food-web diagram. At this stage, I admit that I’m not ready to put the entire draft food-web in this post – it’s far too incomplete. However, it is the perfect time to ask for help, and solicit ideas. From 6 to 13 July, Chris Buddle (Team Leader) and Nicolas Chatel-Launay (undergraduate student) completed field work in Iqaluit – although the weather started cold (6C) and wet, it cleared about half way through our trip and we had several excellent days of collecting. 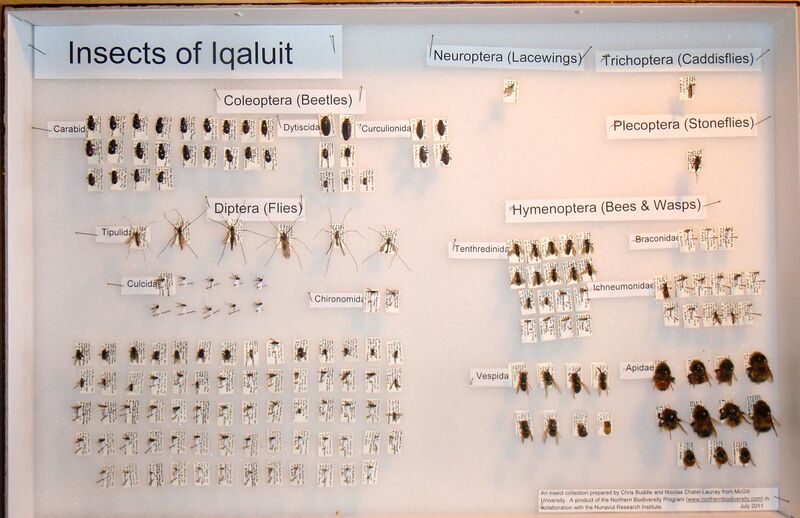 Our objective was to prepare an insect collection of representative and common species in the Iqaluit area. This involved catching, pinning, spreading, and labeling insects and spiders and preparing them in two display cabinets as an ‘educational’ collection. The collection was left at the Nunavut Research Institute in the care of our colleague Jamal Shirley. We ended up collecting half of the known butterfly species for southern Baffin island, and this involved some serious chasing; Nicolas was especially proficient at bounding over the tundra in pursuit of the fast fliers. We also had good representative specimens of ground beetles, bees, and many many flies! We also had help form some people that live in the Iqaluit area: David Nakashuk, a student at the Arctic College, helped us set up our Malaise Trap and helped pick black flies off rocks. First Air employee, and future field scientists Eva quickly become an expert spider-hunter in the afternoon she spent with us. We also spent time with Carolyn Mallory – she has lived in Iqaluit for over 12 years, and has written a soon-to-be-published book about common insects in the North. Carolyn took us collecting at Rotary Park in Apex (5 km from Iqaluit), and she also donated some of her weevil and wasps specimens to our collection. This kind of help is really appreciated. On the 11 July, Chris gave a talk at the Nunavut Research Institute in their brand-new facility. This was well attended, and many insect enthusiasts were in attendance. Given the cool and wet weather, we took advantage of some of the cultural experiences in Iqaluit – we toured the Legislative Assembly on one afternoon, and we took part in Nunavut Day activities on the 9 July. This included watching a seal skinning competition – not something you see everyday! Many local celebrities were in attendance, although the most popular was the NHL hockey player Jordin Tootoo (he’s from Nunavut). We also enjoyed Muskox Burgers at the Store House Bar & Grill, located at the famous Frobisher Inn. We left Iqaluit with mixed emotions – it was sad to leave the long days, friendly people, and ever-expansive Tundra, but also nice to get back home to see family. 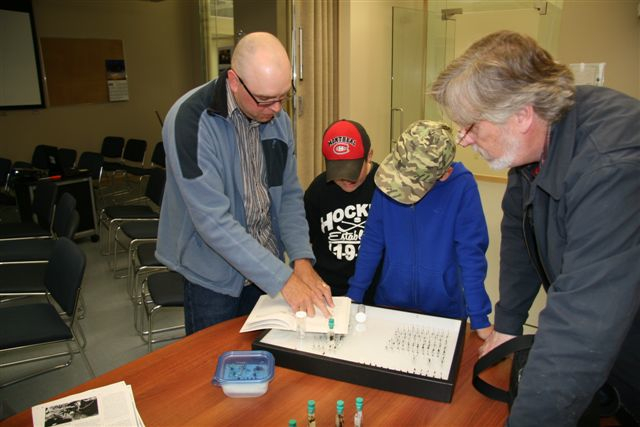 Our Insect Collection was well received and if you are ever in Iqaluit, please visit the Nunavut Research Institute to take a look. 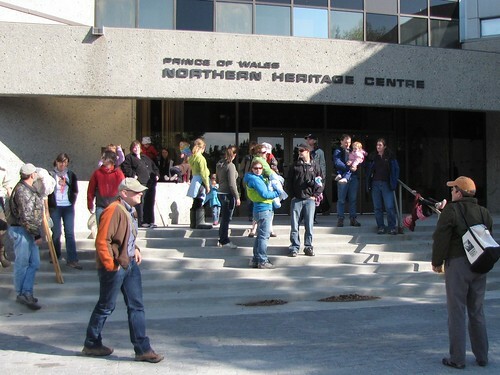 On Thursday, Team Knife spent the evening at the Northern Heritage Centre in Yellowknife, where Bugfest 2011 was taking place. Each team member managed an activity station featuring a different type of insect collection method or expertise. The outdoor fun was followed by a great talk by Chris Buddle. The event was well attended and well received by the very enthusiastic participants of all ages. Check out the article featured on Yellowknife Info for details and photos! The NBP team’s travels from Montreal, Toronto and Ottawa went smoothly, except for the loss of some of our vials in a security check. Thankfully, in Edmonton, the marvelous Felix and Janet Sperling (fellow entomologists) were able to track down supplies for our team on short notice. They took time out of their Sunday afternoon to help us out, and our teams are very grateful! Entomological karma is strong…so good things will certainly come to the Sperling family. 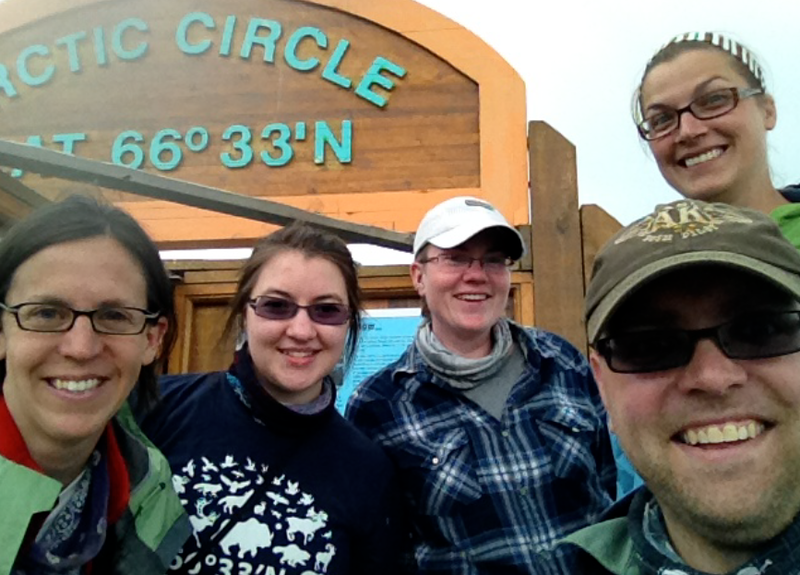 Chris Buddle, Laura Timms, Crystal Ernst, Patrick Schaefer, and Meagan Blair arrived in Yellowknife Monday morning (June 6). Yellowknife is a terrific northern city – although it is not a large town, it feels like a big city because of all the amenities and services. We quickly settled into our hotel, and then proceeded to drive our rental truck (BIG RED) out to a few potential sites to scout out potential locations to set our terrestrial pan & pitfall traps, and our Malaise traps. Along the way we also found some good locations to collect aquatic insects. We are confident that we will be able to set out some terrestrial traps tomorrow (7 June). Although it was a cool day (8 C), the sun was shining and we were pleased to see some small wildlife Camponotus and Formica ants, Pirata wolf spiders, some flies, moths and butterflies) and some larger wildlife (a pair of bald eagles, two foxes, and more than a few ravens). 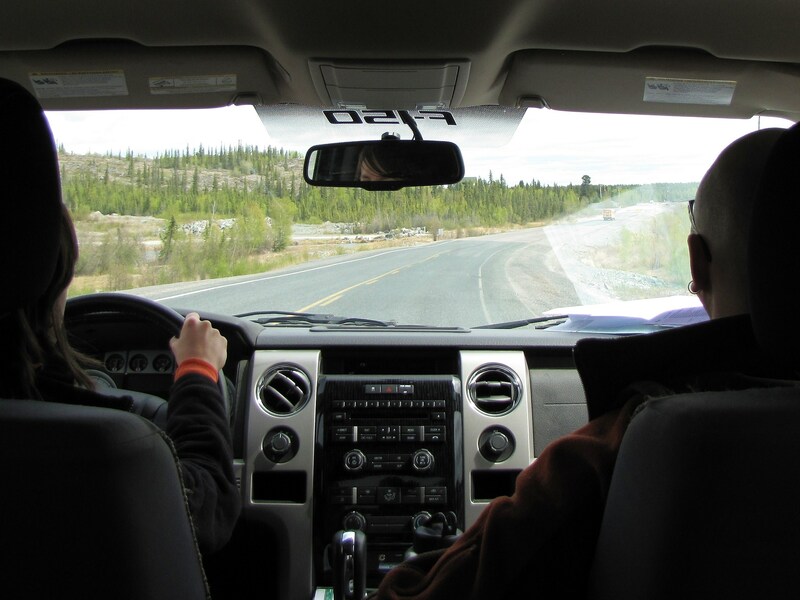 We are excited to be out in the field, and are certain that Yellowknife will prove to be a productive place to collect, and the town seems warm, friendly and welcoming. Iqaluit has been great – although we had a few days of rain and cold, the weather has mostly been cooperative and the sampling has been spectacular. On the warm days the butterflies, bumble bees, and wolf spiders have been incredibly active. So too have been the swarms of mosquitoes! The team has serviced terrestrial traps once, and the samples look terrific. Although the malaise heads are not full of tabanids, they are certainly brimming with a high diversity of flies. 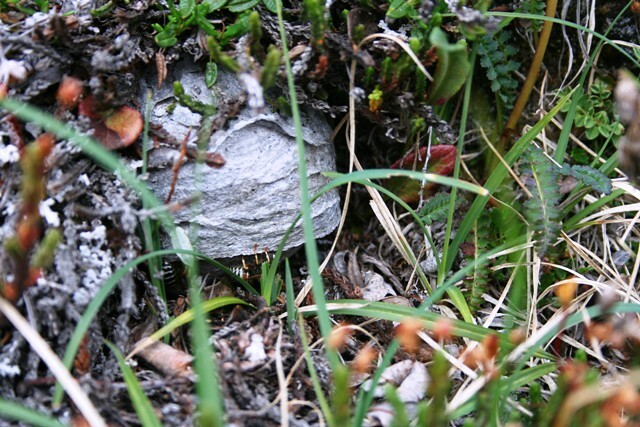 One of our more exciting finds was a nest of the Arctic Yellowjacket (Dolichovespula norwegica)– this species has been found in Iqaluit before, but we now have “official” specimens, and are confident this species is overwintering in the tundra. The aquatic sampling is also very productive: the ponds are full of Trichoptera, and although the mayflies and stoneflies are not large, they are abundant. 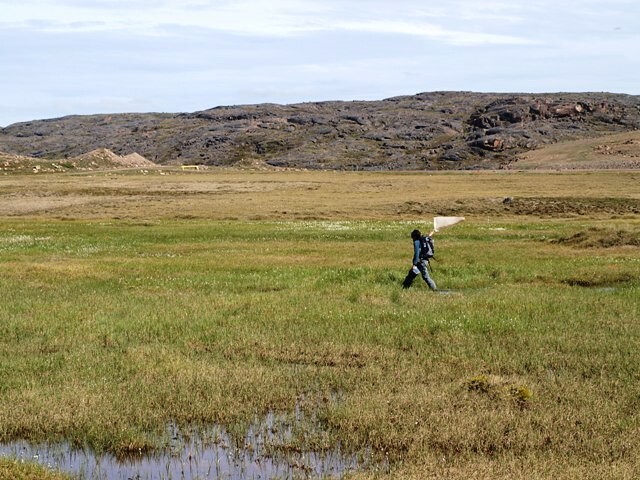 Patrick has been overjoyed with the black fly collecting – in one day the team managed to collect black flies from at least ten different streams and rivers – ranging from tiny seeps emerging from the tundra to the impressive Sylvia Grinnell River, located just beside the Iqaluit Airport runway. We have also enjoyed a lot of local media coverage, including a TV spot on CBC north’s news program “Northbeat”. 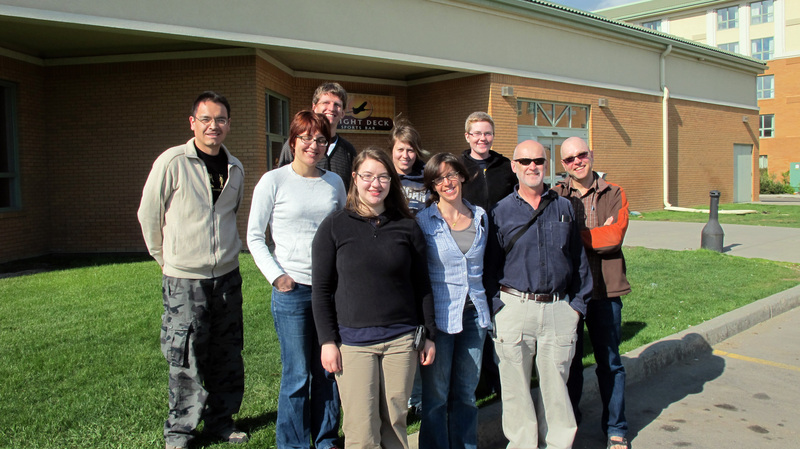 Chris Buddle did a public talk at Nunavut Arctic College that was well attended by entomology “enthusiasts” in town! The team is also spending time with a kid’s Science Camp to talk about entomology. Needless to say, the team has felt very welcome in Iqaluit, and there is a lot of local interest in topics related to insects and spiders of the North. 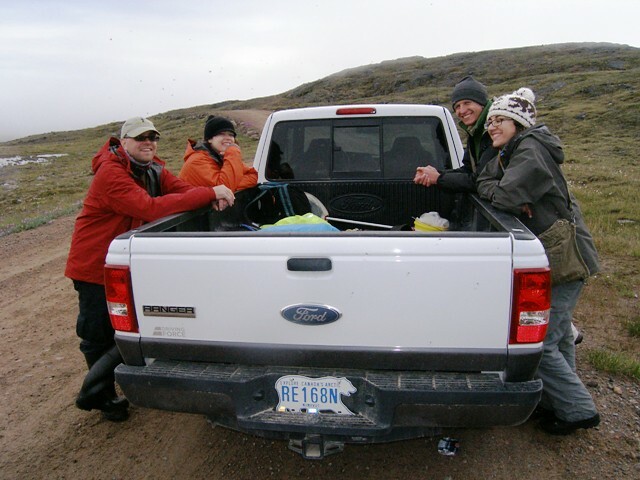 We are especially thankful for the Nunavut Research Institute (see: http://www.nri.nu.ca/ ) for logistical support, and for help from Jamal Shirley. Team Moose has been in contact (via Satellite phone) with Team Goose, currently at Lake Hazen. Although they were two days delayed in Resolute Bay, the team arrived at Hazen and they have already set all their terrestrial traps. On one day they reported temperatures of 15C (warmer than in Iqaluit!) and they also reported mosquito activity that day. They report that “Camp Hazen” is quite comfortable considering the remoteness of the site, and their spirits are high. They are, however, finding access to good aquatic sites somewhat difficult, and the streams and rivers are not that productive. Three members of the team (Sarah, Meagan, Christine) also took a (quick and soap-free) swim in Hazen! Floating among the ice floes….brrrrr. The new “canary in the coal mine” Insects are a window to ecological changes in the northThe weather this year may be hard to predict but one thing’s for sure… When the temperature rises, the bugs come out. People in Labrador have noticed even the creepy crawlies are changing. This is exciting news for one group of visitors to Happy Valley – Goose Bay. They’ve come from all over the country to collect insects. Chris Buddle from McGill University is leading the group. 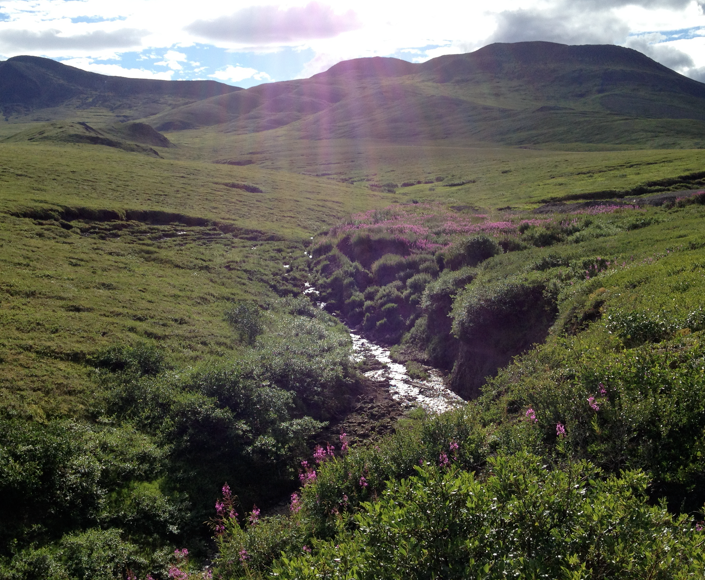 Our Tara McLean put on her hiking boots, and followed him through back trails and shrubby terrain near town. Team Goose was interviewed by CBC Labrador, you can download the mp3 file by clicking on this link! Enjoy!